Is Fast Tracking the Football Stadium Costing the Environment? Governor Jerry Brown and environmentalists are at odds over the Governor's recent approval of a bill that will streamline the environmental impact review process for large scale construction projects. 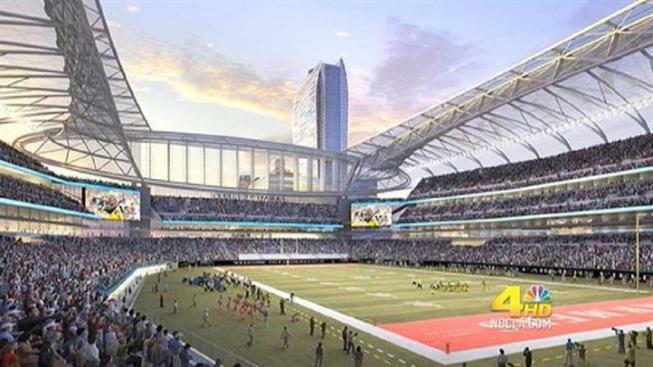 The Governor recently signed a bill that would speed up the process for building a new football stadium in Downtown Los Angeles, making the argument the state is top-heavy with environmental regulations. "I can tell you as Governor when I'm signing hundreds of bills, we have too many laws, and too many rules," Brown said. "We've got to shake things up, we got to pave the way to put people back to work." But have tough economic times put environmental regulations on the back burner in favor of big business? The Sierra Club thinks so and has opposed Brown's move to accelerate AEG's plans to build an NFL stadium called Farmer's Field. The bill would call for any lawsuits against projects like Farmer's Field to go directly to an appeals court, allowing only 175 days to resolve the complaints. The Sierra Club argues that by removing the local courts from the process, the public will have no leverage for negotiating better pollution controls, traffic controls, and better community services for their neighborhood. But Senator Alex Padilla (D-San Ferndando Valley) disagrees. "We're not skirting environmental laws," said Padilla. "We need this for providing a little bit more certainty, a little more light at the end of the tunnel for developers of significant-sized projects liked this." Padilla said the process still requires a full environmental impact study and actually improves transparency in the process.